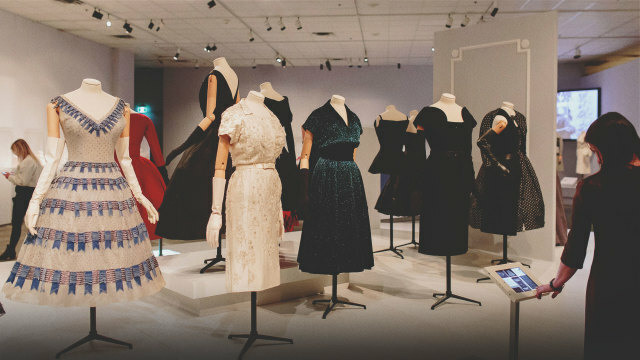 The Christian Dior Exhibit at The Glenbow Museum is the first major, international fashion exhibition to show in Calgary and is also the exhibition`s only Western Canadian stop. The exhibition focuses on the first ten years, 1947-57, of the House of Dior, when Christian Dior himself designed the fashions. Dior's opulent, sophisticated designs reintroduced glamour and elegance in fashion to a world still in early recovery during the aftermath of WWII. Dior revolutionized the fashion industry through licensing deals and by creating a "complete look" of accessories: fragrances, shoes, jewelry, handbags. The exhibition examines all facets of the House of Dior. The influence of Christian Dior's fashion designs and couture methods of construction can still be seen in contemporary beauty standards and still inspire fashion today. The garments in the exhibition come from the permanent collection of the Royal Ontario Museum and were largely donated by Toronto socialites of the 1950s.